We live in a digital world where communication surrounds us. Our minds are constantly flooded by information from various social media platforms and streaming services. Our increasingly fast paced digital lifestyles makes us less and less able to concentrate on online articles and longer publications. This is where infographics come to our aid. Infographics is simply the combination of information and graphics. Generally it can be a combination of icons, illustrations, charts and/or data visualization. They can be used to either just show hard data, facts or to tell a story. Infographics is an important part of today’s visual storytelling. 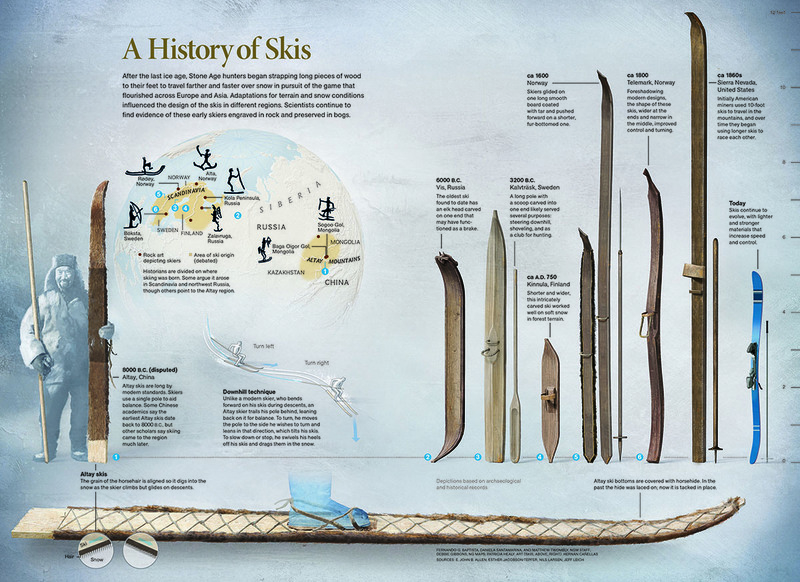 Skiing Through History, December 2013, National Geographic. Infographics can be used to spice up annual reports, presentations and print design. In web design infographics are a useful way to display company-related numbers or to open up services. A perfectly crafted infographic can bring light to even the most complex information and make it more accessible and engaging for everyone. When utilizing infographics in your media, it’s important to make sure the facts are up to date and valid. Used right, infographics are a very useful way to get traffic to your website via social media. Having a goal or a message is vital, building a story around it keeps the reader hooked. One of my absolute favorite infographics is a bit peculiar. It’s not your typical run-of-the-mill text, numbers and illustrations. It tells a story as an interactive experience and simplifies otherwise hard to comprehend information. You can see the infographic in question here. How about the future of infographics? Instead of just making data understandable can it be part of the movement that is transferring data into an experience? Read more of data visualisations in VR world from Pekka’s blog post.